In order for Canada to achieve its climate targets and mid-century decarbonization goals, emissions from existing buildings must be significantly reduced and construction practices must rapidly evolve to reach net-zero energy ready standards for new buildings. Shifting new construction to net-zero ready by around 2030 will lead to a significant reduction in emissions from new buildings, but will not be sufficient to achieve deep emissions reductions in the building stock as a whole. In B.C., for example, it is estimated that code requirements for new buildings will result in less than a third of the reductions needed in the building sector by 2050. Therefore, the federal government will need to work with the provinces to create and implement a comprehensive strategy for existing buildings, resulting in emissions reductions needed to meet overall climate targets. While the federal government has set economy-wide emission targets, it has not defined how much reduction should be expected from each sector of the economy, including the building sector. This is also the case for most provinces in Canada. Sector-specific targets are needed to guide appropriate levels of retrofit activity for buildings. 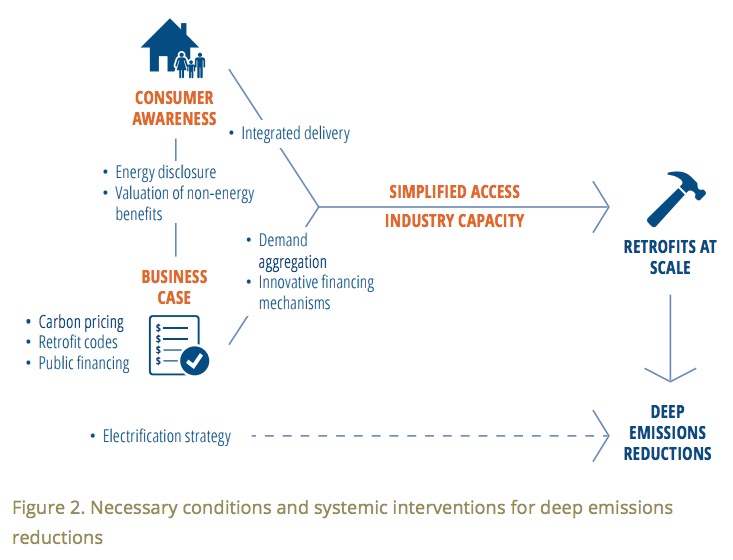 Setting a vision for a decarbonized building sector by 2050 offers a clear guiding principle and a consistent approach for sub-national governments to follow. A vision for Canada’s building stock that delivers on climate commitments is one that sees an evolution to ultra-energy-efficient construction, deep energy retrofits and switching to low-carbon fuel sources. Read the discussion paper, published by the Pembina Institute and The Atmospheric Fund. Tags: National, British Columbia, Federal Policy, Energy Efficiency, Buildings. We believe that important economic productivity gains can be achieved through energy efficiency and fuel switching in the building sector, and that this should be supported in Budget 2019. Équiterre and the Pembina Institute offer a suite of ambitious and practical policies aimed at ensuring rapid implementation of the building commitments outlined in the Pan-Canadian Framework on Clean Growth and Climate Change.